So, everyone remembers hearing this story growing up. There's thousands of sick men sticking razor blades in apples and pouring cyanide on halloween candy. Seemed believable enough. Why? Because it's shocking and memorable. Those types of stories tend to "stick." Just like conspiracy theories, old wive's tales, etc. They're simple and they get passed around. There was a 12-year old boy who wanted to try smoking for the first time. Well, when you're a kid, your saliva has an excess amount of a particular growth hormone chemical in it that happens to be flammable. 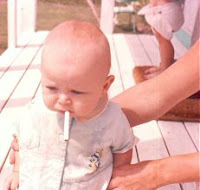 The child put the cigarette in his mouth, and he instantly erupted into flames. It'll make your kid think twice before lighting up. Looks like lying is the answer after all. Unrelated, but what are your thoughts on Don Imus? He should apologize for the horrendously distasteful comments. He did. Now, it's a decision to be made by MSNBC whether or not they want to support him, and they made it. The bigger question stemming from this is why are Jesse Jackson and Al Sharpton the eternal spokesmen for the african-american race in this country? to have a race represented by 2 guys like this really does not help the race as a whole. if anyone is helping the black community it is Jesse Lee Peterson, also called the Other Jesse. wow, wikipedia makes that jesse lee peterson guy out to be a jerk. alright, we're getting off the subject here. The point is we need to start lying to the future of America! We're going to have to come up with a better lie, though. The beauty of the razor blades thing is that it is tough to disprove because it is not an every time thing. The first time one of their friends, whose parents obviously neglected to lie to them, smoke, the lie is out the window. Maybe if we say it only happens to some kids ... and maybe get a doctor into the lie to tell them they are one of them ... yes, I see a plan forming.